Within the Museum collection is an extremely touching set of papers that once belonged to Captain John Hammond of the 7th Battalion. As a Commanding Officer in the First World War, one of Hammond’s duties was to write to the families of men who had been killed or were missing. Included in these papers today are letters from grieving families in reply to his original bad news. I write on behalf of the mother of Pte A. Nobbs in your Coy [company] who was killed by a shell last July. 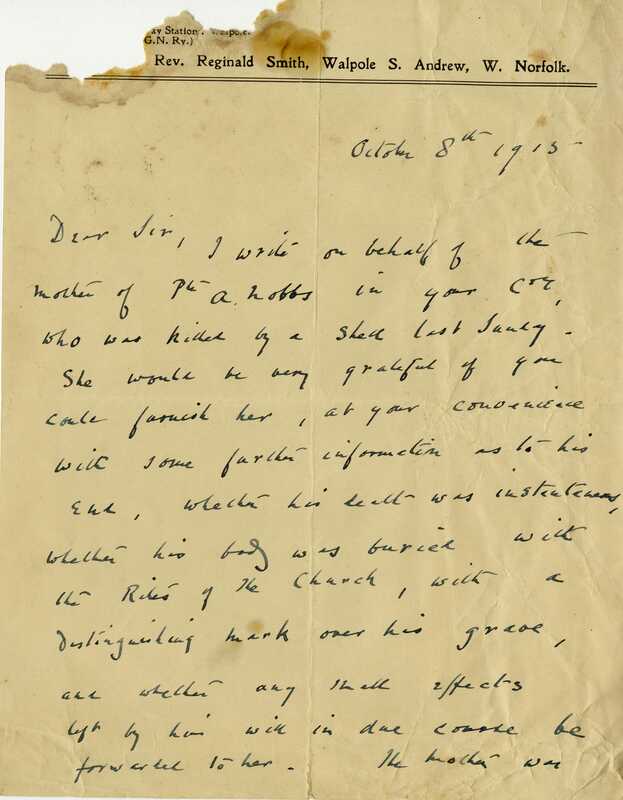 She would be very grateful if you could furnish her, at your convenience, with some further information as to his end, whether his death was instantaneous, whether his body was buried with the Rites of the Church, with a distinguishing mark over his grave, and whether any small effects left by him will in due course be forwarded to her. 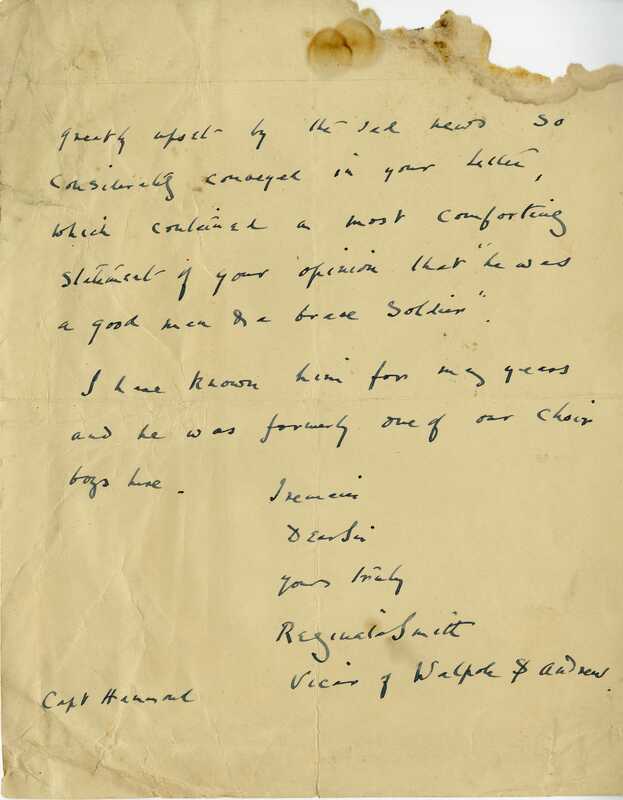 The Mother was greatly upset by the sad news so considerately conveyed in your letter, which contained a most comforting statement of your opinion that ‘he was a good man and a brave soldier’. I have known him for many years and he was formerly one of our choir boys. These letters offer a startling insight into the thoughts of many families in the immediate aftermath of their loss, and show in a small way their impact within the community. The polite, deferential language commonly used make them all the more touching. Moreover, their very existence today tells us a great deal about Captain Hammond too. These letters meant a huge amount to him, and are cherished by the museum. 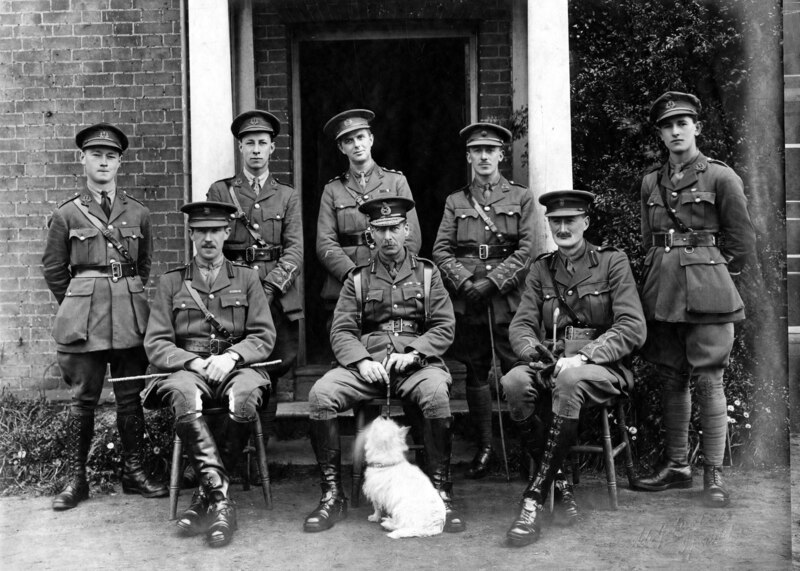 This entry was posted in research project, War Diary and tagged First World War, Norfolk Regiment, Royal Norfolk Regimental Museum, The Norfolk Regiment, The Royal Norfolk Regimental Museum. Bookmark the permalink.